There is more to an enjoyable BBQ experience than the best smoked meat. Taking a scenic drive to a historic building where meat cutting has been done for generations makes for a memorable visit. How about cheap beer and live music with hot BBQ served for dinner or a BBQ joint in a small downtown area with antique shops and stores that are a draw on their own? 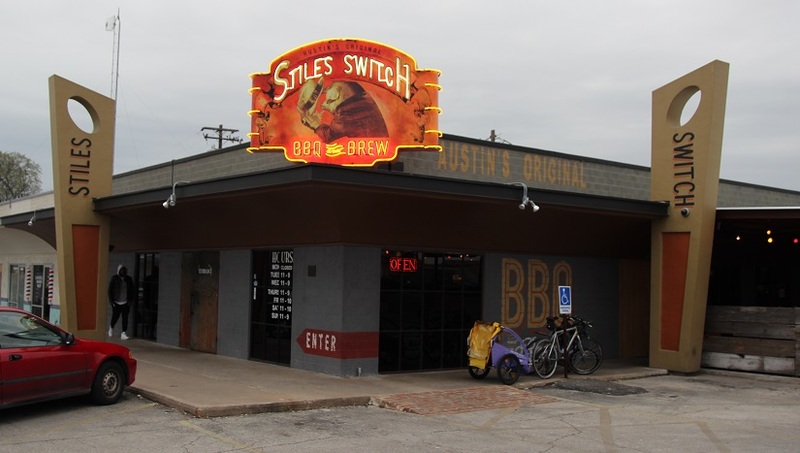 It’s that time of year when the SXSW crowds pour into Austin, and inevitably many will hit the popular nearby barbecue joints. For both locals and visitors though, there are a plethora of great barbecue experiences either an Uber ride or a short drive away. I present to you a list of my favorite joints to visit for ambiance, location, historical reference, and outright good times in this Austin BBQ Guide. I’ve personally eaten at all of these joints, multiple times. 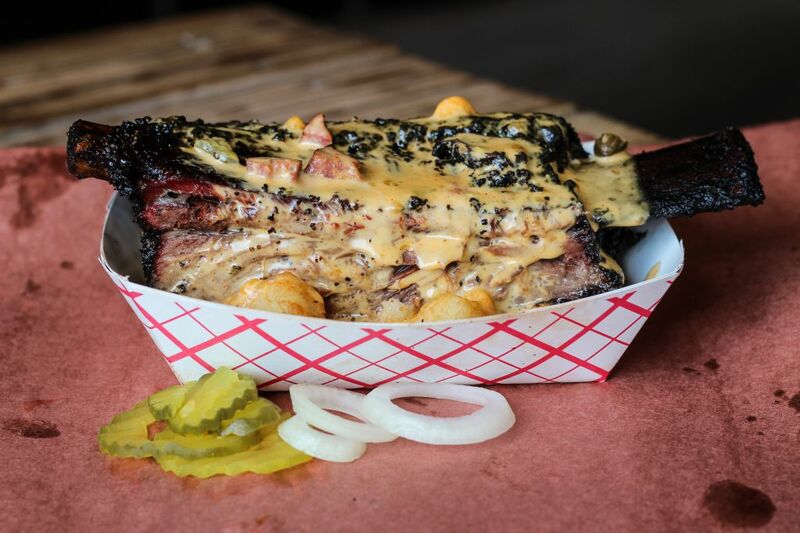 The quality of the smoked meats varies greatly in the list, from well outside the TMBBQ top 50, to some of the best in the state. (Ones I highly recommend for food quality are marked with a treasure map) The ones without a treasure map are still an enjoyable getaway from the routine and may have even made the Texas Monthly Top 50. Note that you won’t see trailers or Franklin Barbecue on this list. I’ll put out a list based purely on smoked meat quality without regards to lines or trailers in the near future. Again to reiterate this is not a list of the best smoked meats, but a list of places that have a great experience quotient, and this almost always eliminates trailers or long lines. Standing in the Texas sun and/or using a porta potty just isn’t the pure barbecue experience. These places are just an Uber/Lyft ride away and you will avoid the long lines at the East Austin favorites. In fact, you could eat at all 4 of these locations, including driving between them, in less time than it takes waiting in line at Franklin. Hours: Closed Monday, Open Tuesday-Sunday see website for details. Located in a building erected in 1869 by a former slave, the well-stocked whisky and spirits behind the bar belies the wizardry that occurs out back. Evan Leroy and team cook up some truly incredible meats and sides behind the building. There may be a short wait for a seat, but there are no long lines waiting to order at a counter. Relax at a table and let the server start you off with an adult beverage while you contemplate the selections. No one does brisket bark better than Freedmen’s, and most everything I’ve had here is excellent. An added plus is the barbecue is available in the afternoons, although it may sell out before dinner. Recommended: Texas trinity, Beef rib, brisket, pork ribs, pit chili (frito pie). Order the jalapeno cheese plate as an appetizer. If you were a fan of the movie Dazed and Confused you might recognize the shopping center where Stiles Switch is located as it was featured in the film. The shopping center hosted the “Emporium” pool hall in the movie. Now that we got that out of the way, the establishment itself serves up quality barbecue and cold craft beer. Another joint that is open late into the evening and a good choice for dinner and drinks. Step off to the patio and play some games if the night is cool. Shane Stiles and pit master Lance Kirkpatrick were doing fine barbecue before, but I’m excited about the recent addition of Bill Dumas, formerly of Smokey Denmark’s. Bill brings another angle to the crew and glad to see him taking up residence alongside the Stiles’ crew. 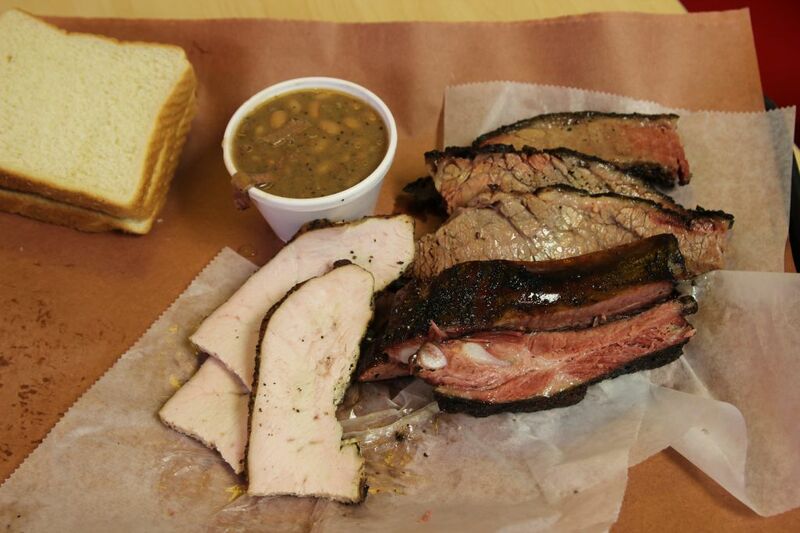 The Cooper’s locations west of Austin (the Mason and Llano locations have different owners) both have a similar west Texas style; mesquite wood is burned down to coals, and those hot coals are placed directly below the meats. As fat drips off the meat it sizzles on the coals and flavor is imparted back onto the meat by the resulting smoke. This lends itself to a different taste than from an offset pit where the wood and coals burn in a firebox located away from the meats. Personally, this is not my favored method for brisket but it works very well on pork, and giant pork chops are a specialty. Another standard for the Cooper’s locations is that the meats are displayed in a large warming pit, and you make your selection from what’s hot and available. The beans are also free, another tradition of the other Cooper’s restaurants. This isn’t “central Texas style” so be aware that you will get a different type of product than the slow smoked meats more common in the Austin area. The Austin location is a convenient way to get the Cooper’s experience without making the drive. Parking can be an issue so take a ride in or use the valet parking option after 5pm. Live music isn’t yet on the calendar but the stage upstairs at the Llano Llounge looks like it will work well and it provides a nice view. Have a craving for real Lockhart barbecue, cooked in Lockhart? Black’s is your answer. It may be a surprise but the brisket you buy anywhere almost never came right off the pits. Brisket and most barbecue needs to “rest” a couple of hours, and four or more is perfectly fine. The meats for this small satellite location are trucked in from nearby Lockhart which is only a little over 30 miles away and retain the same quality. You lose the drive, the quaint small town, and the option to visit Kreuz and Smitty’s which are great experiences in their own right but if you can’t get out of town hop an Uber or the bus and get over to Black’s. These restaurants are close enough that the drive is just a short discussion away. 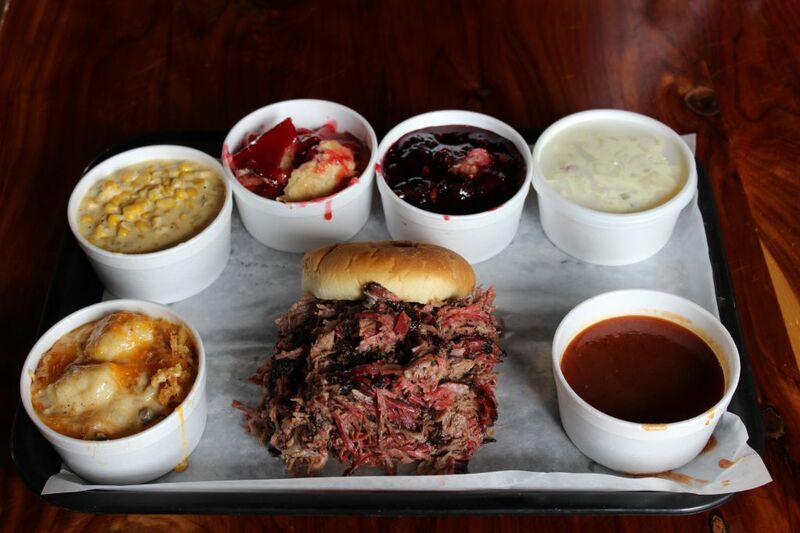 Break away from the traffic and hype of Austin and enjoy some small town barbecue. You’ll be there before you know it, and these are well worth the short drive. There is not a lot that hasn’t already been said about Louie Mueller. Wayne Mueller keeps the fires burning at the Taylor business while brother John runs his own gig at John Mueller Meat Co. and sister LeAnn runs her enterprise at la Barbecue. John and LeAnn’s places are both worthy stops in their own right but are trailers so by default they do not make this particular list. At Louie Mueller you step back in time as you cross the threshold of the building, built in 1959, into a business that was established 10 years before that. There is something special about that screen door that snaps shut as you step inside and begin your feast first for the eyes and nose. The high ceilings of this former basketball gymnasium do little to stifle the smoke that wafts through the building but the smell is intoxicating. The tradition continues as you view the day’s options handwritten on butcher paper taped to the wall, enjoy a free sample as you order, and sit down near the wall of smoky business cards as you eat. There is no air conditioning here, so be aware if your trip is during the Texas summer. The line also gets long here at prime lunch time so arrive when they open the doors for the best experience (see hours above’) Visiting at noon on Saturday will result in a 45 minute or so wait. If you make the drive to Taylor, also consider a quick stop at Taylor Café just around the corner at 101 N. Main St . 92 year old WWII veteran Vencil Mares keeps watch over this relic from the past which is more a combination beer and barbecue joint than a classic meat market. I recommend ordering some of the unique turkey sausage and their beef sausage. Owners Todd and Kristin Ashmore weren’t born into the barbecue business. Their lives took the turn after a number of Texas barbecue tours and Opie’s was born out of their love of barbecue. It grew from a roadside stand into the establishment it is today. While the building and location don’t provide much historical value, the joy lies here in a combination of the quality of the food and the scenic drive. FM1431 is regarded as one of the better drives in the state, and one can also stop by Longhorn Caverns and Marble Falls for side trips on the way back. The experience here is a unique combination of west Texas style with central Texas, and the result is exceptional. A large warming pit opens to display the available meat selection which is cooked with Mesquite. Rather than direct heat though, the pits are offset for the low and slow method. Pretty much everything here is worthy, but my favorites are the brisket, beef rib, baby backs and spare ribs. If you haven’t already heard of the tater tot casserole and butter beans, then you have been missing out as both are not to be missed. Even better, pinto beans are always free, and butter beans are available on weekends, also gratis. Don’t forget to pick up a rock band style Tshirt on the way out, they are some of the coolest in the business. Recommended: Brisket, beef rib, baby back and spare ribs, tater tot casserole, spicy corn, butter beans, and the desserts. 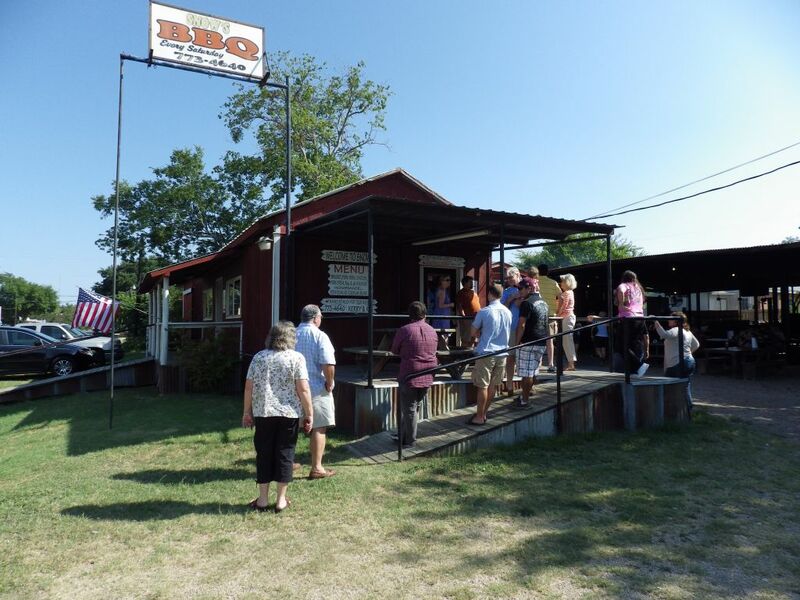 If you like a rocking good time to go with quality barbecue, then Hays Co. should be on your short list. The great folks of the Hernandez family along with Zack, Jessie, Omar, and the rest of the staff bring the good times to San Marcos. Barbecue is available into the events and on the weekends barbecue live bands rock the crowd from a stage in the large back area. Very reasonably priced beer from the “beer bus” makes for a great evening visit. The meats and sausage are the star here but order up some of the “amazing beans”, they will make you rethink what is possible with pinto beans. Sure you can see their unique indoor grills at their Austin locations, but head down to the original Driftwood restaurant for the full experience. Cash only is accepted at this location, but an ATM sits in the lobby if you didn’t plan well. I’d recommend a lighter meal here like a sandwich rather than gorging yourself, although if you must they offer an all you can eat option for $24.95 per person. Meats are finished on indoor pits and offers up a great photo opportunity. 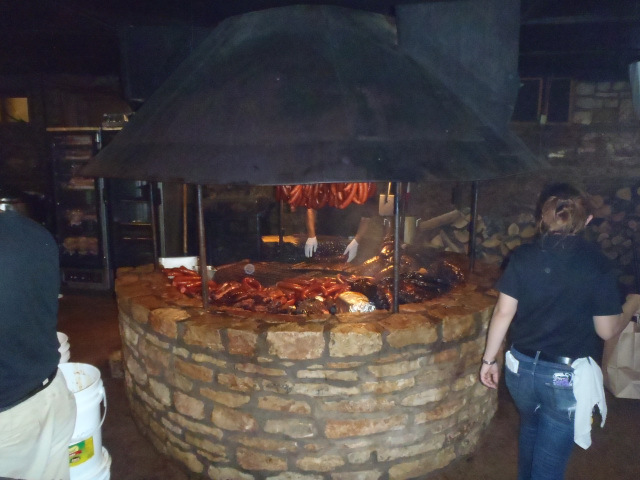 The Salt Lick is bashed by some of the new generation of barbecue lovers, and the quality of the smoked meat does pale against the best in the state lately, but the overall venue is a unique experience and worthy of at least one visit. Eat inside, then sit under the old oak trees while you chat over beers or wine. If you haven’t been out to the little town of Lexington you have missed out on another unique experience, and this is one of my very favorite destinations. Charming pit master Tootsie Tomanetz along with Kerry Bexley and family make this an unforgettable destination. I remember the first time I was told of this gem, and it just didn’t register. Only open one day a week? Only open from 8am until early afternoon? In a small out-of-the-way town? Why would I want to waste part of my day on such an odd thing? While the brisket prices have been raised a few times to match increases in costs, my most recent visit in March 2016 still posted a very reasonable $14.95 per pound pricing on brisket. The tiny briskets they use here combined with a foil wrap rather than the butcher paper wrap that has become more common makes for a unique, but tasty product. The bark on the brisket is soft and in my favorite discussion with Miss Tootsie she regaled with a wink in her eye “If you want crunchy bark go take a bite of that tree.” The pork ribs here wow me every visit, and thirteen visits later I still am impressed. The beans here are free but are a tasty treat. The line starts when they open at 8am, stretches beyond the porch, and can be 30-45 minutes long at times. I recommend arriving early, anywhere from 8-9am. The drive from here to Louie Mueller is only around 20 minutes so it’s an easy two-stop trip. 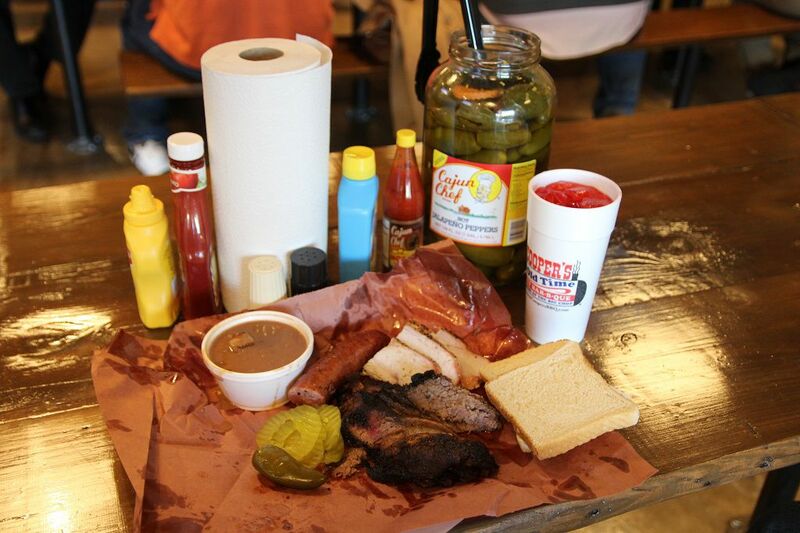 A quick drive to Lockhart will put you squarely at the official “capital of barbecue” in Texas. While Austin has been the darling over the last seven years, a trip here is memorable and entertaining. 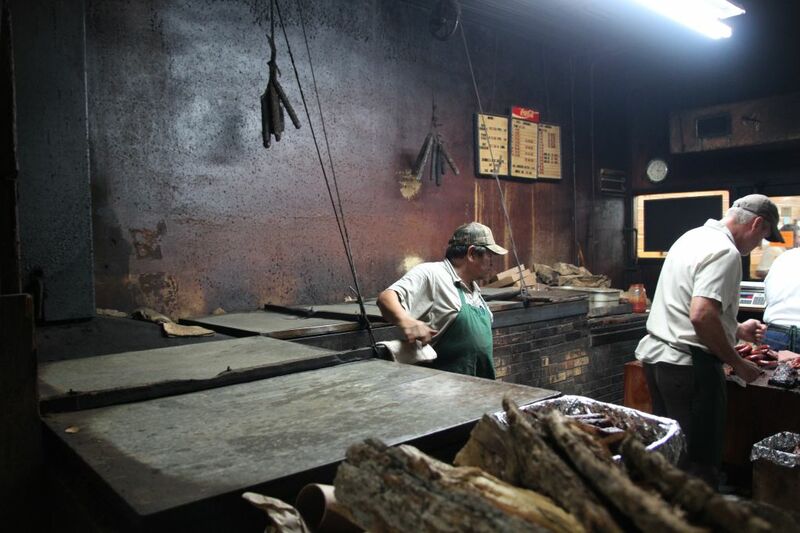 A pilgrimage to this city and nearby Luling is a must-do for any lover of smoked meats. A bonus is that meat pricing here is significantly lower than in Austin, essentially paying for gas if you bring several friends. 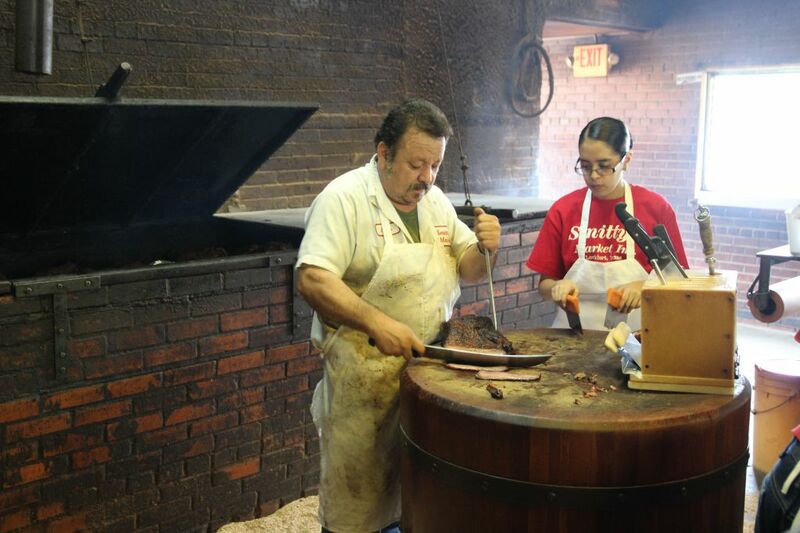 Smitty’s is one of the best examples of the old school meat market style that is the roots of Texas barbecue. 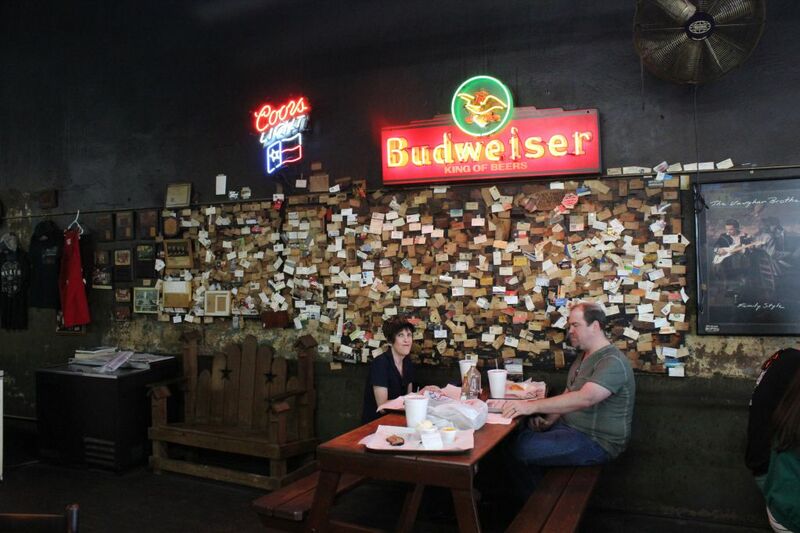 While they fell off the TMBBQ top 50 list in 2013, a visit is an absolute must if you want to experience original Texas barbecue. Rather than entering from the Hwy183 side circle around to the front of the building. Step in through the meat market, into the smoke room, and be careful not to step into the open fire burning beside the pit. Gaze past those pits to the round cutting block and upward to see stalactites of smoke particles from years of cooking at a business originally established in 1900. The short version of the details are that before refrigeration, meat markets would smoke unsold product to preserve it. Customers would purchase meat by the pound, and buy hot sauce, bread, cheese, and/or pickles from the other part of the store. They didn’t sell bread by the slice or have hot sauce available for the customers, it was the leftovers from previous purchasers that began the traditions that you see today. 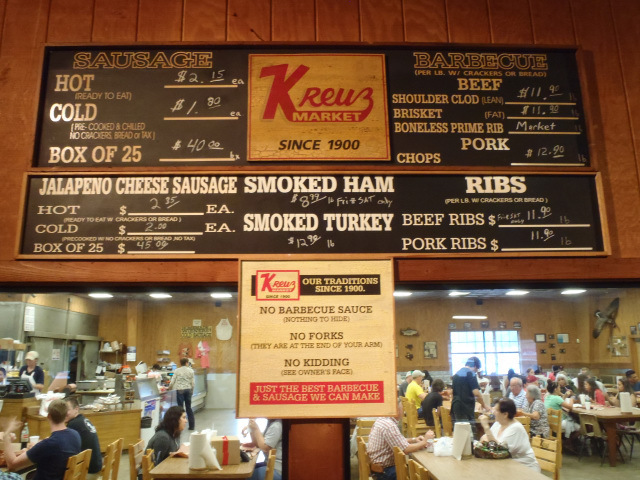 The original name of the business that Smitty’s is located in was called Kreuz Market (rhymes with “kites”.) A right with longtime owners in the Schmidt family split the business and with much fanfare, still hot coals were dragged down the street to fire up the pits when the newer Kreuz Market building was opened. For more info check out their history here. 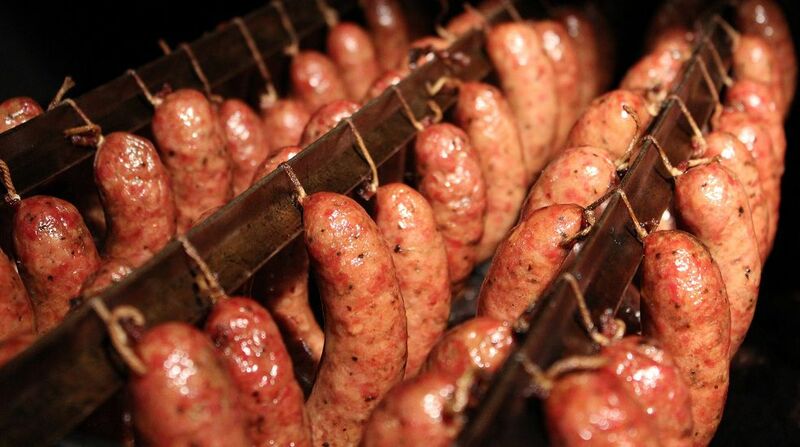 https://www.kreuzmarket.com/about-kreuz-barbecue-lockhart-texas While the building doesn’t have the history embedded in it that Smitty’s does, seventeen years of smoke pouring out of the vast array of pits in the smoke room have seasoned it well. The experience here when you first enter couldn’t be more different than Smitty’s. 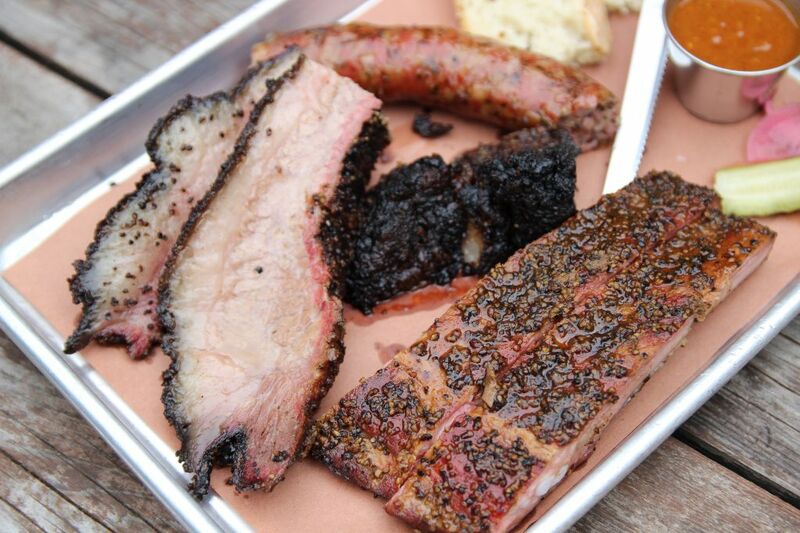 Rather than a humble smoke room, Kruez is like the Disneyworld of barbecue. Numerous pits are tended with their own fires while multiple cutting stations keep the line moving on busy days. They use round cutting blocks like Smitty’s and you order and pay for your meat separate from drinks and sides which are purchased in the market section also in the tradition of true meat markets. Pit Boss Roy Perez keeps the meats in check here, but don’t ask for sauce because there isn’t any (although there is hot sauce, there is no barbecue sauce.) There also are no forks. Recommended: Brisket, sausage (one of my favorites in the world), pork chops, and if you prefer lean brisket try the shoulder clod, a leaner cut of beef and one seldom served elsewhere. The experience at Black’s is different than that of its Lockhart siblings. After navigating a narrow hallway you pick up a tray and order your sides cafeteria style before making your way to the meat stations. The business was founded in 1932 and has been owned by the same family its entire life. While the building doesn’t ooze the long history of Smitty’s, check out the photos along the wall of presidents and others enjoying Black’s over the years. On my last visit Black’s had the most seasoning in the brisket rub and was the most flavorful of the Lockhart joints. As with the other nearby joints the sausages are made in house and are worthy of a taste. 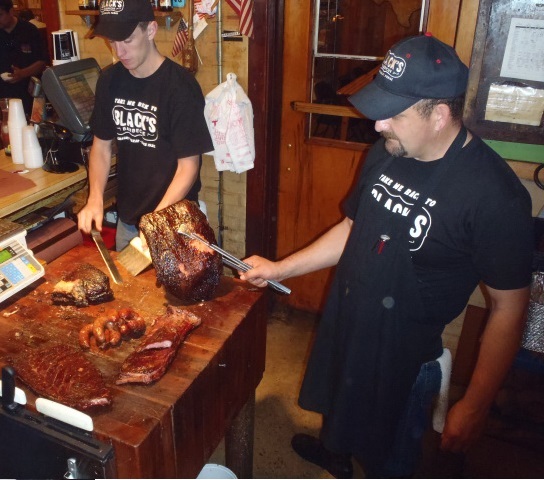 If you consider yourself a serious meat lover and don’t mind added a few miles to a Lockhart road trip, driving the additional fifteen miles to Luling is in order. The wood paneling on the walls evokes a 60’s or 70’s feel which carries through the experience. The line here gets long at lunchtime on the weekends so arrive at or before 11am. The brisket may not be on the level of the elite, but on my last visit it was a paltry $13 a pound. Sausage here is what I usually order and it’s extremely reasonably priced as well. Sometimes I’ll order up a pork rib to go with it, but it’s the sausage that brings me back. As a bonus, you can head west from Luling and make it to Hays Co. then head back to Austin via I-35, knocking out five joints in short order. Go get on the road! Tags: Black's, City Market, Cooper's, Freedmen's Bar, Hays Co, Kreuz Market, Louie Mueller, Luling City Market, Opie's, Salt Lick, Snow's, Stiles Switch.